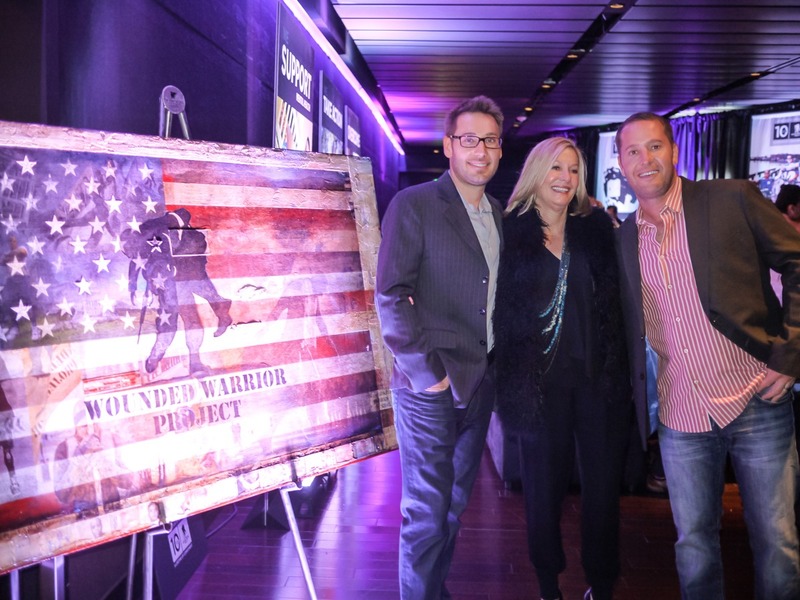 Local artists from the Slade Project donated a custom work of fine art to the Wounded Warrior Project that was unveiled at the second annual Carry Forward Awards® presented by Bank of America, at Club Nokia at L.A. Live, October 10, 2013. In honor of the 10th Anniversary of the Wounded Warrior Project® (WWP), a nonprofit organization that helps returning wounded veterans and their families successfully adjust back to civilian life, local artists from the Slade Project have donated a custom work of art that was unveiled at the second annual Carry Forward Awards® presented by Bank of America, at Club Nokia at L.A. Live, October 10, 2013. The Slade's collaborated with executives from WWP who gathered materials for the artwork that are part of the overall composition. The focal points of the 48’ x 72’ piece include the Wounded Warrior Project logo, actual warrior photos and maps, beliefs, quotes, and writings, underpinned by a theme of patriotism. As part of the project, the Slade’s filmed every step of the artwork creation process and have edited it down to a short time lapse video, which will be released publicly sometime in the near future. “From the hearts of the Slade Family to the hearts of the soldiers and their families, we dedicate this token of recognition and appreciation to the warriors who have made so many sacrifices that will affect our lives forever, said C.W. Slade. “We are honored to unveil the artwork at the Awards Event." The Carry Forward Awards is a campaign to recognize passionate individuals, culminating with an awards celebration fundraising event. Funds raised at the event will further Wounded Warrior Project® (WWP) programs and build awareness of the needs of injured service members and their families. 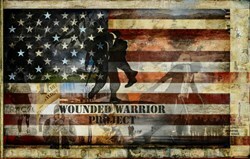 After the event, the artwork will be displayed at the WWP headquarters in Jacksonville, FL. Read more about WWP and how you can make a positive and lasting impact on warriors and their families at the Wounded Warriors Project home page. For more information on custom commissioned fine art, visit http://www.SladeFineArt.com. Your Life. Your Memories. Your Masterpiece. The Slade Project is a family of artists that collaborates to integrate a collector’s photography and other tangible possessions into fine art. Dustin Slade works in conjunction with the collector to design the layout of the artwork and, in some cases, coordinates a photo shoot with Emily Slade. In the second phase of the project, Jesse and C.W. Slade transition the digital imagery to canvas and work together to utilize a variety of the collectors preferred colors, materials, and techniques to further express the story told through the digital imagery.